South India has always been a land shining with a rich enriching heritage and cultural treasure. Its civilization is blessed with extraordinary temples, architectural wondrous temples and exquisite suave and unique monuments. In order to get a better insight into the beauty of South India, the various forts present there can be looked at. The glorious days of the bygone era shall be loved by the enthusiastic travellers and you shall not regret investing your time and energy in visiting these lovely forts of South India. It is also famous by the name Anchuthengu Fort, the fort and the lighthouse are both visit-worthy. Can you guess what does the word 'Anchuthengu' mean? It stands for five coconut palms. It was put up by the British East India Company in the year 1695 after it was granted permission by the Queen of Attingal. If you talk about the Anglo-Mysore war, this fort served an important purpose back then. It comprises a fort, 130 ft tall and has a perfectly beautiful view. Make it a point to drop by here, whenever you visit Varkala in Kerala. The best time to visit Varkala when the weather is good is January, February, March as well as October, November and December. You can view the picturesque Badami Fort located on a hill-top and keep awing at its beauty. It goes back to the 5th century and the building credits go to Pulakesi, the second. Let your eyes wide open for this cannon dating back to the 16th century. Where shall you find this fort? It is located in the Bagalkot district of North Karnataka and is quite well-known for its vibrant culture and history. The entrance is well-guarded by Shiva's bull named Nandi who is again immersed in the colours of archaeological brilliance which shall sweep you back to the pre-historic times. The most convenient time to visit the Badami Fort is January, February and the months from September to December. When it comes to talking about a graceful fort which still stands strong after 800 years, it has to be the Golkonda Fort of Hyderabad. Its acoustic effects are magnificent as the sound of a handclap at a certain point right below the entry point, can be heard at the peak of the pavilion, which is like 1 km away. This was the perfect warning point for the Royals in case of an attack. Derived from the words Golla Konda, it basically meant shepherd's hill in Telugu and if a legend is to be believed, an sacred idol was discovered by a shepherd's son and the Katakiyan king then gave orders to build a mud fort around its vicinity. Can you guess who is deemed the Troy of East by the British? It has to be the Gingee Fort. However, it is not a people's favourite as yet because it is not that easily accessible and is one of those few forts which is still surviving in the state of Tamil Nadu. Are you interested in knowing what else it comprises of? It has an eight-storied Kalyana Mahal (marriage hall), granaries, a military gymnasium, prison cells as well as a temple devoted to a Hindu goddess called Chenjiamman. Now the very midst of the Warangal Fort is actually an archaeological department which shall present to you the ruins of a Siva temple, which had been destroyed by the attacking armies and excavated later on. The entry spot was not a much liked one but it was the archways which stayed strong later on also due to its durable and well-planned design. One cannot find a hint of religion as the design patterns here are totally non-religious, unlike most historical monuments in South India. The Belgaum or Belgavi Fort (as it is known now) of Karnataka shall give you goosebumps with its exotic history that goes back merrily to the Ratta dynasty. One fact about it which shall capture your interest for sure is that the father of our Nation, Mahatma Gandhi was captured by the British in this very fort during the freedom struggle of India. The gorgeous Chitradurga Fort is the pride of the state of Karnataka. It has 18 grand temples in the upper part and one big one in the lower section. However, would you like to know which one is the oldest and most interesting temple? It is the Hidimbeshwara Temple. When it was Hyder Ali ruling, he made sure to include a mosque as well in the fort. A lot of tanks were inter-linked for the purposes of rainwater harvesting and we feel proud to announce that this was one of those forts of South India which never suffered any kind of water shortage. This is one fort filled with grandeur in the state of Tamil Nadu. The Vellore Fort flaunts a church, mosque as well as a temple in its vicinity. This fort shall draw your attention because of three reasons. The first being that the very last king of Sri Lanka, as well as Tipu Sultan's family: both, were held captive here during the rule of the British. The second reason is that the aggressive rebellion against the British had begun from this fort in 1806. And lastly, the sad slaughter of the Vijayanagara family belonging to Emperor Sriranga Raya also significantly happened here. The Bekal Fort is one of those forts which we can say uses queer developed defence strategies in its architecture. 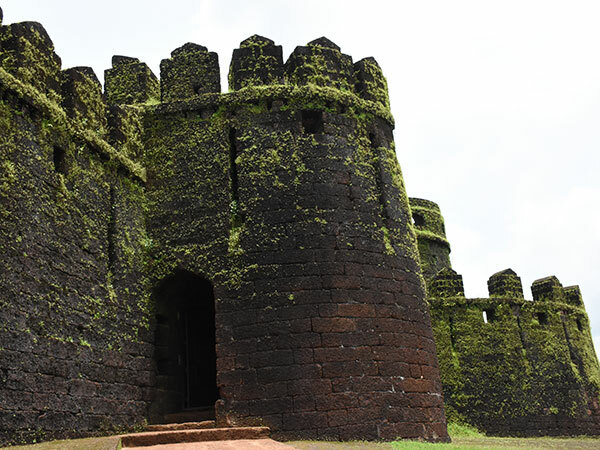 It emits positive Kerala vibes with holes on the outer walls for the fort's protection. The ones at the top were aimed at striking at the farthest points whereas the ones at the bottom served for attacking the enemy on point when he was close. Plus there were holes underneath as well which were meant for catching the enemies off-guard when they were extremely close. When the Bahmani sultanate comes to notice, Bidar Fort is one of its most significant remnants. Located in the historical city of Bidar in Karnataka, the fort comprises of at least five Darwazas or the gateways. Towards the beginning of 1724, Bidar became a part of the kingdom of the Nizams while Mir Nizam Ali Khan Asaf Jah III put his brother into jail in this very fort. Its always something to think loud and clear as to what is this connection between forts and imprisoned people! You can catch a glimpse of the Kondapalli Fort in the Krishna district of Andhra Pradesh which is in close proximity of Vijayawada. Can you guess who built this fort during the 14th century? It was Prolaya Vema Reddy of Kondaveedu. This fort served two wonderful purposes like it shall soothe you with a bout of pleasure as well as you can suit up here and get welcomed to a business centre at the same time in Guntur district. Later, it became useful as a military fortification and the British couldn't help establishing a strong garrison here! Have you set foot into the Kondaveedu Village in the Chilakaluripet of Guntur district in Andhra Pradesh - home to the impressive Kondaveedu Fort? Perched at 1700 ft above sea-level, the Kondaveedu Fort, is a lovely hill fortress which was built by Prolaya Vema Reddy and then it was placed under the control of the Reddy dynasty between 1328 and 1428. It was later taken over by Gajapatis as well as the Vijayanagara emperor Krishnadevaraya who was captivated it in 1516. The beautiful Vizianagaram Fort belongs to the 15th century and was transformed into a beautiful fortification by the Gajapati Rajas. How did it get its name? It was named after Pusapati Peda Vijaya Rama Gajapati Raju who is one of the most important kings of Gajapati dynasty and was later taken under control by the Devarayas of Andhra Pradesh. Imagine going to this place called Chandragiri in Tirupati and stumbling across Chandragiri Fort in Andhra Pradesh? This fortification again came into emergence in the 11th century when it was built by Yadava Naidus. Later the Vijayanagara empire caught hold of it in the 14th century and the most interesting piece of information is that the popular Vijayanagara emperor Sri Krishnadevaraya spent his childhood in this very fort like an absolute prince. Legend also says that he even set eyes on his lady love in this very fort, whose name was Chinna Devi. Talk about the Vijayanagar Empire and you shall see that Chandragiri sweeps in as the 4th capital. Heard about the Rayas? They shifted their capital here when the Golconda Sultans let out a war-cry on Penukonda. You can zero in onto this fort on the west coast of the Uttara Kannada district. Many battles were fought at this exquisite location in the brutal past. The gorgeous architecture is praiseworthy and it is only 0.5 km away from the NH17. Now, the most interesting fact about this piece of grandeur is that it was commissioned in the 16th century by a Queen! The Queen Chennabhaira Devi of Gersoppa ruled for about 54 years and also made a living in the fort. That's all about forts, folks!